Leatherwood has a long storied past which dates back to one of the most well regarded sniper optics ever used by the military. Today they make some very high quality optics at prices which are about half to a third of comparably clear and bright optics. One of those optics is the CMR, Close to Medium Range 1-4x24 scope. 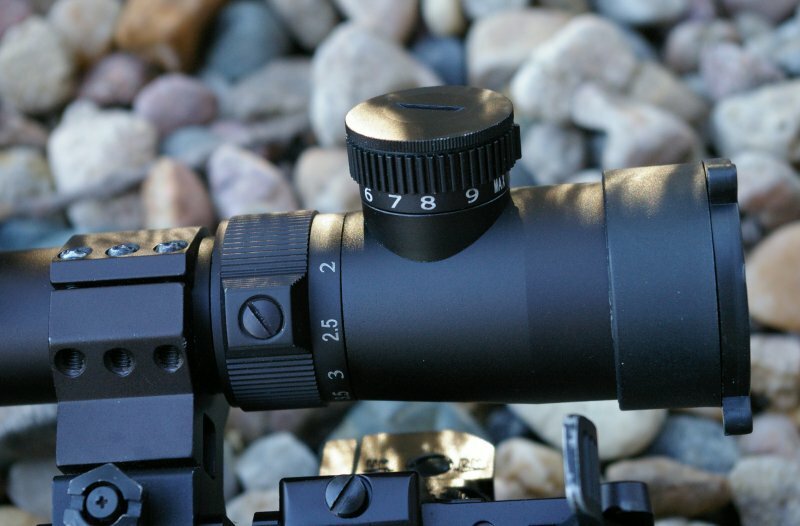 A ton of refinement has gone into this optic and the stunningly useful reticle which delivers both a quick shooting CQB semi-donut and hash mark options to 800 yards and MRAD precision increments. The 1-4X optic power range has become a very hot area as 3 Gun shooters start to move around while shooting or shoot standing unsupported. Big magnification will just lead to frustration and slow shots. 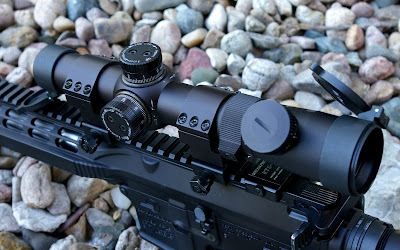 This low power optic concept is based on the military Designated Marksman optic requirements were moving and shooting is the norm at distances from 0-600 yards. Thus the need to have variable optic with no magnification at 1X for both eyes open close range shooting, but have the ability to bump up the magnification for more precise shots at distance. The Hi-Lux CMR4 reticle is incredibly unique in the industry. Based on a significant amount of US military consulting input, the CMR4 combines that wonderful donut+dot close range fast targeting sighting system with BDC (bullet drop compensating) reticle plus a Mil grid system on the reticle. Once you learn to really use the capabilities of this optic, you will not want to shoot anything else. The Hi-Lux CMR4 illuminated reticle is available is your choice of red or green illumination however the reticle is visible as black without the illumination on. Unlike some reticles that only illuminate the center dot, the Hi-Lux reticle illuminated the donut+dot and the full BDC tree but excludes the Mill grid marks. Hi-Lux added two additional night vision settings for glare free shooting in the dark of the night. Crank up the illumination and you have an outstanding CQB optic, however the illumination is not visible in direct sunlight. 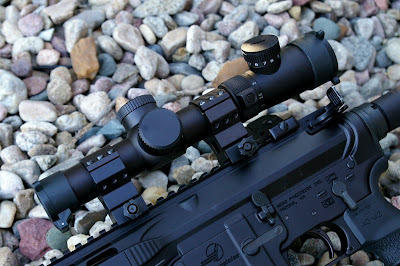 Where most optics are designed around a single duplex reticle with a “best ballistic compromise” zeroing point (usually 300 yards for AR15s), a BDC reticle like the one on the Hi-Lux CMR4 greatly increases precision at all ranges. For example, an AR15 zero’ed to 200 yards delivers a bullet path that will vary approximately 1.5” high at 100 and only 1.5” low at 225 yards and a 300 yard zero will get you out further, however the bullet path will vary considerably more up to 4.5” high at 200 yards to 12” low at 400 yards. The BDC reticles offer more precise pre-calibrated aiming points than a single duplex reticle and offer you most precise shot placement at all distances. The CMR4 BDC is designed around the ballistics of the 55gr ballistic tipped Hornady TAP round however I found that most other 55gr rounds matched the BDC marks well at 200, 300, 400, 500, and 600 hash marks and provided a hit and satisfying gong ring at each distance. The updated CMR4 has expanded MRAD grid marks the full width and depth of the reticle which can take you beyond 1000 yards if you have the skill. Hi-Lux has made the reticle marks faint enough that they do not get in the way, but are visible enough when you need them. 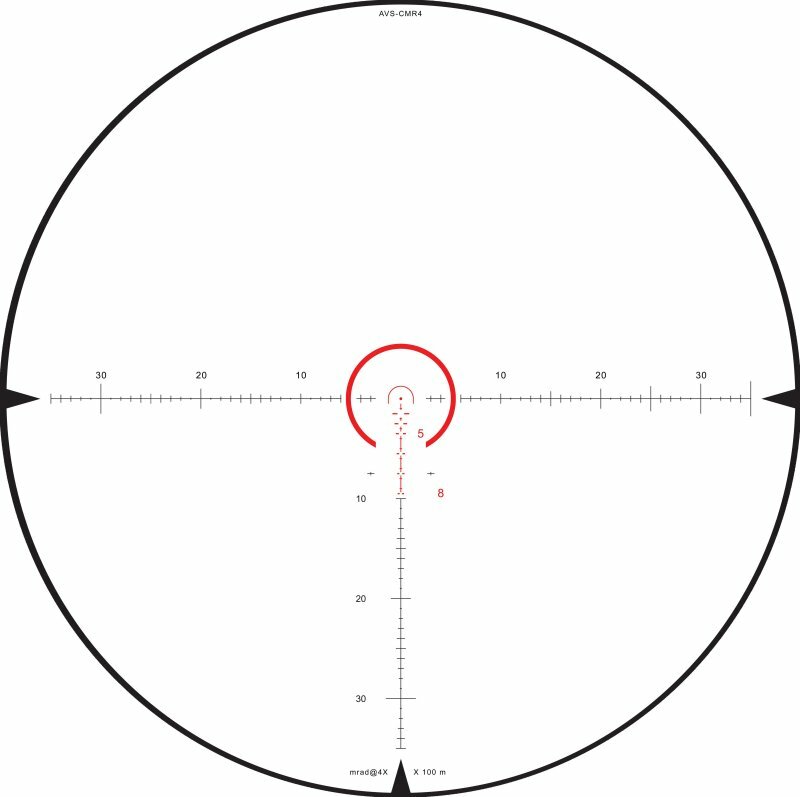 What this grid of Mil data provides is 40 mils of hash marks of elevation and windage left/right plus a BDC reticle and the unique ability among the optics to leverage a ballistic calculator accurately to place shots all without touching the turrets. With the donut+dot, BDC and Mil grid, there is little this optic cannot do quickly, however they did not stop there. Hi-Lux also moved the turret windage adjustment to the left side so you don’t need to lift your firing hand off the grip to make adjustments.Other updates includes adding flip up scope caps and turret caps which cover full sized Mil adjustment turrets (0.1 Mil per click, and 80 clicks per revolution). The CMR is the only optic in this price class that offers both resettable zero and a zero stop turret design. Yep you got it, find zero, lock it in and no matter where you end up on your turret spins, you will always be able to return to zero even in pitch black by spinning back to the hard stop. I mounted the CMR4 to my custom Aero Precision Geissele trigger equipped AR15 with a custom White Oak match .223 Wylde (.223 match) barrel. This optics is more than durable enough to top a 308, 30-06, Mosin 7.62x54R and would be just the optic to transform a forgotten 308 to a mighty fine scout rifle. Testing was at yardage increments of 2, 25, 50 in various lighting conditions and BDC tests of 100 yard increments from 100-600 yards. The CMR4 excelled at all the test except delivering visible daylight illumination. From fast defensive shooting at short distances to slow longer range shots, I was exceedingly happy with the extreme versatility of the CMR4. I own several Hi-Lux Leatherwood optics and the clarity is superb and in my opinion are one of the top values in the 1-4x optic market. If you are a ballistics nerd like me, this reticle has it all satisfying short arms length to long range hit capability. 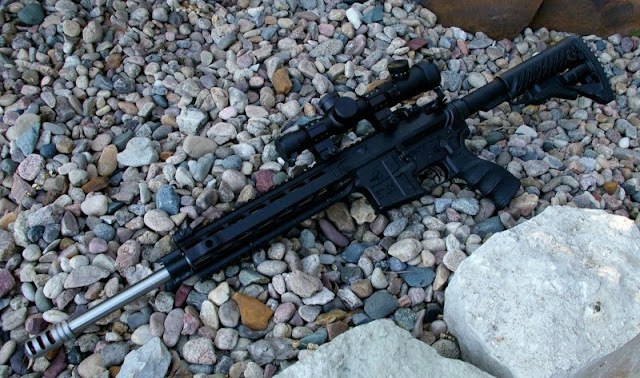 Great on .223 or .308 platform for precision work with a low power optic. It is an all purpose optic which has also proven itself as a hot hog hunting optic with a partial donut-dot to bring you on target fast and enough data to keep the serious data driven shooters happy. An excellent optic and don’t forget the older versions are still great, so keep an eye out for those as well in the used market. So do you think that the added cost over the original CMR is worth it? Essentially it is the same optic, but with an improved reticle and the movement of the turret to the left side. Its my understanding that the old model is out there but discontinued. I think if you plan on really reaching out at distance with this optic on a larger caliber (308) platform then yes, the new reticle can make a lot of sense. If not then you might be able to save a few bucks and get the older model. When I first heard about it I thought it was a more expensive upgrade from the original but both would be produced and sold. It looks like they changed their minds, then only have the CMR4 on the Hilux page. Thanks.